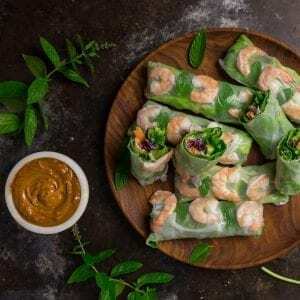 If you’ve ever eaten at a Vietnamese restaurant (or had the pleasure of traveling to the country, you adventurer), you’ve probably had summer rolls. 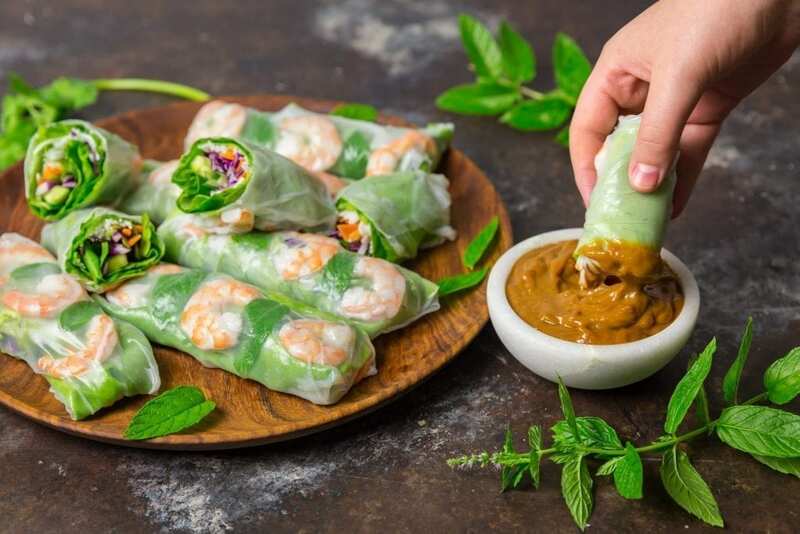 They’re sometimes called “fresh spring rolls” or “salad rolls”, but not to be confused with traditional spring rolls, which are often smaller, fried, and filled with cooked vegetables and pork. 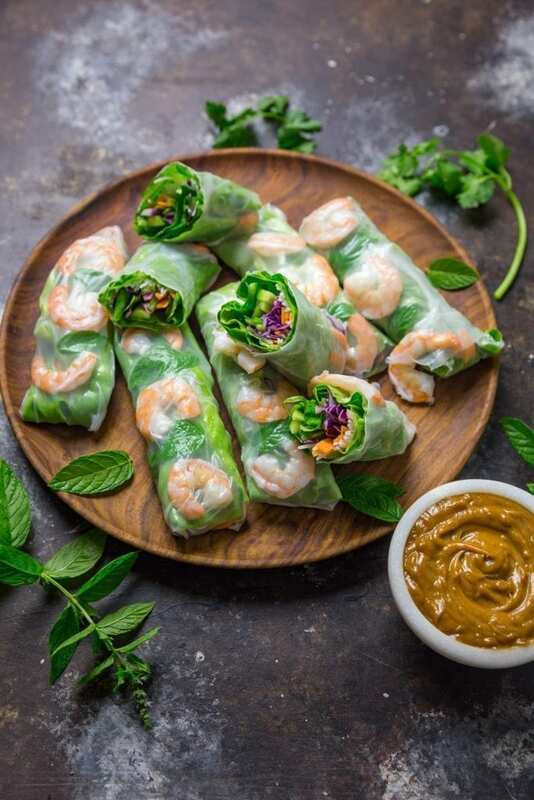 These are the epitome of fresh and light, filled with finely shredded raw vegetables (we used purple cabbage, carrots, cucumber & scallions, as well as butter lettuce), lots of bright herbs like mint, cilantro and basil, rice vermicelli noodles and poached shrimp, all wrapped up like a translucent burrito in a rice paper wrapper. We love the flavors of Vietnamese cooking (as you can tell by some of our previous recipes: Vietnamese-style baked chicken and Vietnamese Grilled Pork Chops (Thit Heo Nuong Xa). I first made Vietnamese Summer Rolls over a decade ago and I’ve been wanting to make them again ever since. When we found out we were going to have a weekend houseguest, our 12-year-old niece Charlotte, who is an adventurous eater and a great cook in her own right, we thought these would be a fun dish to make together. I always make the sauce first since it tastes better after it’s had a chance to sit. It’s so simple; mix up all the ingredients into a bowl and try not to eat it all before the rolls are done. The rolls themselves are easy in that most of the work is prepping the vegetables. Mung bean sprouts are traditional but they make my mouth itch so we left them out. Other than that, we used pretty classic ingredients, but feel free to mix it up. You can use grilled tofu instead of shrimp, and you can really use any vegetables you like to eat raw, as long as you cut them into very fine slivers. If they’re too thick, they’ll be difficult to roll up and might tear the delicate rice paper. Thinly sliced avocado, mango and grilled chicken would be great. Or you could try seared tofu, bean sprouts and basil. You can prep the veggies a few hours ahead if you want, just cover them with plastic wrap and store them in the refrigerator. The rice vermicelli noodles can also be made ahead and chilled. Cook them according to the package directions, then run cold water over them to cool them down. This is one dish where you’re going to want to buy slightly smaller shrimp than you might usually purchase. Look for medium sized (U36-40, meaning 36-40 per pound). These will be large enough to clean easily but small enough to roll up with a minimum of awkwardness. Once they’re de-shelled and de-veined, poach them for just about a minute or so in lightly salted boiling water. I actually turn the heat off the water when I put the shrimp in, as the residual heat is plenty to cook them through. Once they’re opaque and curled, they’re cooked. Scoop them out with a slotted spoon and immediately plunge them into an ice water bath to stop them from over-cooking. Once they’re cool, you can dry them and slice them in half, lengthwise. Keep them cold until you’re ready to use them. Now that everything is prepped and ready, you can set up your work area. 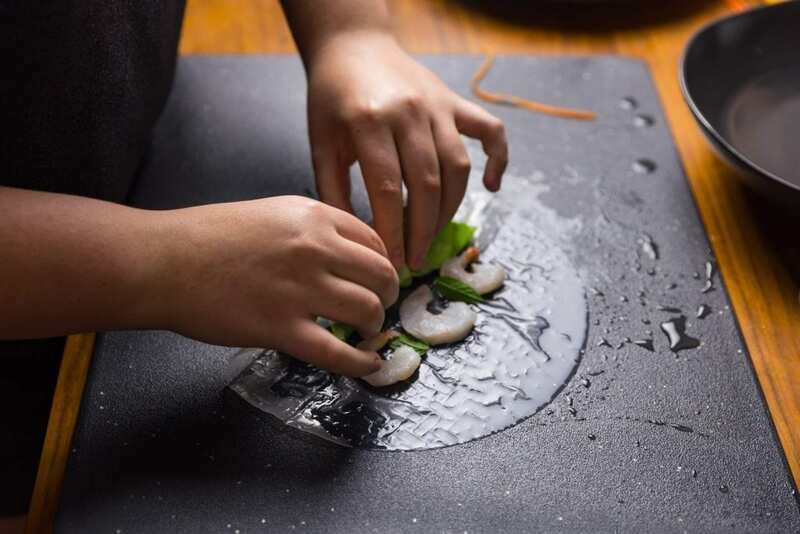 You’ll want a surface you can get wet, like a large cutting board, along with a wide shallow bowl or dish filled with warm water, to dip the rice paper. Set up your ingredients within easy reach: the shredded vegetables, chilled rice noodles, lettuce leaves, herbs and shrimp. 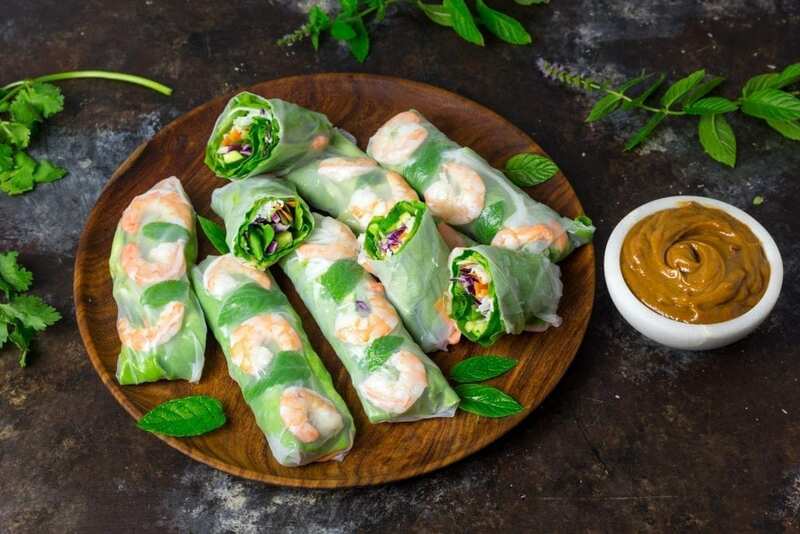 Our trick is that we like to roll everything except the shrimp and a couple of mint leaves into a lettuce leaf, like a salad cigar, with keeps all the slippery ingredients in place so nothing falls out. Lay a lettuce leaf on the board (remove the thick end of the rib, if needed) and place a little bit of rice noodles (less than a quarter cup), and a little bit of each vegetable, as well as a couple of cilantro or basil leaves. Don’t overfill. Roll the lettuce up and set it on the edge of the board. Then take a rice paper sheet and dip it into the water for about 15 seconds or so until it starts to soften (it will soften more as it sits). Put the sheet on the board and lay down 3 shrimp, cut-side up, a little more than half-way up the center of the sheet, leaving about an inch or so on either side. Place a mint leaf between the shrimp, if you want. Then roll the paper over the lettuce, tuck in the sides, and continue rolling over the shrimp. Press the it closed and keep the finished rolls under a damp kitchen cloth or paper towel and some cling wrap, until you’re ready to serve them. Continue on to the rest of the rolls. I love the colors that show when they’re cut in half. Kids (and adults) love dipping them in peanut sauce. For the peanut sauce: Whisk all the ingredients together in a small bowl; set aside. For the summer rolls: Cook the rice noodles according to the package directions. Drain and set aside. Bring a medium pot of salted water to a boil over high heat. Add the shrimp, turn off heat and poach until bright pink and opaque, about 1½ minutes. Drain in a colander and run under very cold water until cool. Dry with paper towels and cut each shrimp in half horizontally (making them thinner). Place on a plate, cover with plastic wrap, and refrigerate until you’re ready to roll. Fill a wide, shallow dish large enough to hold the rice paper wrappers with warm water. Arrange all of the filling ingredients within easy reach around a work surface. 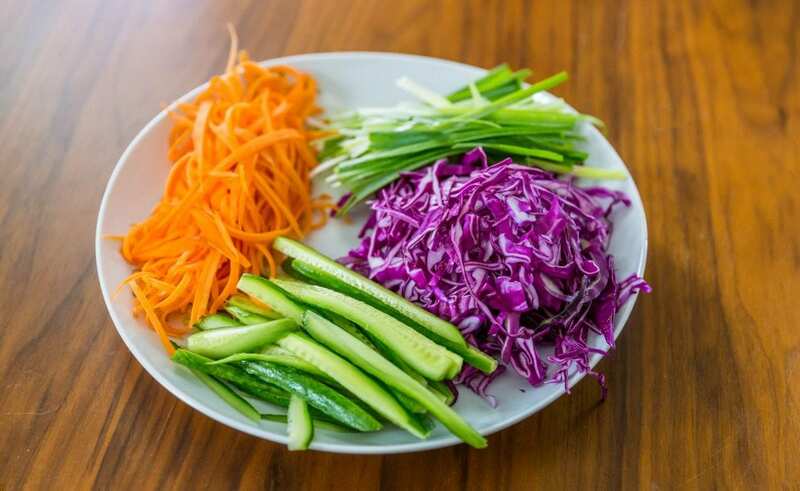 Lay down a lettuce leaf and place a arrange a little bit of rice noodles, cabbage, carrots, cucumbers, scallions and a few cilantro leaves in the middle. Roll lettuce around the noodles and vegetables in a cigar shape and set aside, seam side down. Working with 1 wrapper at a time, submerge rice paper until it is soft and pliable, about 10 seconds (it will soften more as it sits). Remove the wrapper from the water and place it on the work surface. Lay 3 shrimp halves in a row, cut side facing up, just above the center of the wrapper, leaving about 1 inch of space on each side. Place 1 mint leaf between each shrimp. Place the filled lettuce roll just below the shrimp. 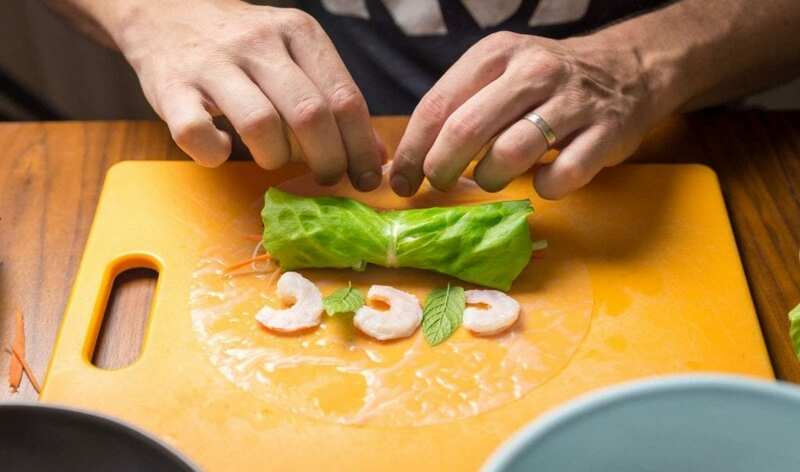 Fold the bottom half of the rice paper wrapper over the filling and roll until the shrimp and lettuce are secured. Then fold in the sides of the wrapper. Then roll the entire wrapper so it becomes sealed, like a burrito. Place roll on a rimmed baking sheet and cover loosely with a lightly damp paper towel and plastic wrap. Repeat with the remaining wrappers and fillings. Leave a little space between each summer roll so they don’t stick together. If not serving immediately, keep the rolls covered with damp towels and plastic wrap at room temperature for up to 2 hours. Serve with the peanut sauce for dipping. I love these shrimp rolls Thanks for the tips on rolling them. I will make them for my guest and they will love them too!